DuraSpace is an independent 501(c)(3) not-for-profit organization providing leadership and innovation for open technologies that promote durable, persistent access to digital data. We collaborate with academic, scientific, cultural, and technology communities by supporting projects and creating services to help ensure that current and future generations have access to our collective digital heritage. DuraSpace-supported open technology projects provide long-term, durable access to and discovery of digital assets. The DSpace, Fedora and now VIVO (since 2014) projects are directly supported with in-kind contributions of development resources and financial donations through the DuraSpace community Sponsorship Program. DuraSpace services include DuraCloud, a subscription service for archiving, sharing, and managing content in the cloud, DSpaceDirect, a low-cost, turnkey hosted repository service which can be used to preserve and provide access to academic faculty and student papers, projects, and research, and ArchivesDirect. The DuraSpace team includes recognized leaders and experts in the management of digital information, who work with an active international community committed to the durability of digital resources. DuraSpace was founded in July of 2009 as the result of two of the largest providers for managing access to digital content coming together, the DSpace Foundation and Fedora Commons. Combining their strengths allowed the two organizations to work on joint initiatives that would better serve their respective communities rather than competing within the small institutional market. Fedora (Flexible, Extensible Digital Object Repository Architecture) was originally designed at Cornell University in the late 1990s in anticipation of managing digital content. From 2001-2007, Cornell and the University of Virginia combined efforts in utilizing the Fedora design to create the Fedora Project. This became the repository foundation stewarded by a variety of organizations to develop innovative methods of accessing and managing diverse collections, which were deployed by hundreds of institutions worldwide in exciting new ways for education, open-access publishing, and e-science. In May 2007, with a $5 million grant from the Gordon and Betty Moore Foundation, Sandy Payette established Fedora Commons as an independent non-profit organization. The goal of Fedora Commons was to build a community of scholarly, scientific and educational users who would openly collaborate with the Fedora Commons team to continue developing the open source software. DSpace, a joint development effort by Hewlett Packard and MIT begun in 2002, was developed as open source software to manage research, scholarly, and other published content in a digital repository, focusing on long-term storage, access, and preservation. As DSpace users increased, a group of institutions formed the DSpace Federation in 2004, which determined the governance of future development for DSpace. By July of 2007, the growth of DSpace prompted HP and MIT to form the DSpace Foundation led by Michele Kimpton. The DSpace Foundation was a non-profit organization that provided technical leadership and administration to support the increasing number of DSpace users. 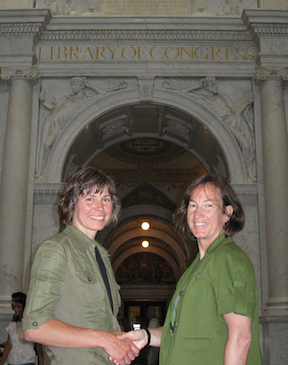 Sandy Payette and Michele Kimpton in front of the Library of Congress in 2009. DuraSpace was founded by Michele Kimpton and Sandy Payette in 2009. Realizing that repositories were becoming a key part of the infrastructure for supporting scholarly work, both Fedora Commons and the DSpace Foundation saw an opportunity in providing a unified approach to the academic and scientific communities. In the spring of 2009, executives and stakeholders of both the DSpace and Fedora communities met to discuss the potential benefits of a collaboration. By working together, both communities could be strengthened greatly through the use of shared services, lower overall operating costs, and new opportunities and capabilities for accessing and preserving digital content. In July of 2009, both non-profit organizations joined to become DuraSpace. The collaboration brought together over 500 organizations from around the world that were using either DSpace or Fedora. With strong scholarly and scientific communities, committer groups, open source projects, and a deep understanding of the challenges of digital preservation coming from both Fedora and DSpace, DuraSpace would continue the mission of leveraging new technologies and developing new strategies for the greater community. The DSpace Foundation, with over 350 user installations, had brought to DuraSpace a small sponsorship program which provided supplemental funding to the organization. Using this as a model, DuraSpace launched a Sponsorship Program in 2010 to ask the communities, partners and collaborators for financial support in order to continue the organization’s efforts towards sustaining and improving the Fedora and DSpace projects. The program proved to be extremely successful, with tiered sponsorships (Gold, Silver, Bronze), exceeding first year goals, and commencing a program that is at the core of DuraSpace’s financial sustainability today. At the same time, DuraSpace was developing additional revenue-generating programs and services in order to shift from a fully-grant-funded organization to one having a more diversified portfolio. In 2010, DuraSpace launched the Registered Service Provider Program to build strong relationships with key service providers with expertise in DuraSpace technologies. This program generates annual revenue from organizations which grow and increase their revenue based on services associated with DuraSpace open source platforms. With Moore funding, DuraSpace was able to step up its efforts in adding solutions to its portfolio of offerings. From 2009-2011, DuraCloud was the first hosted solution developed as a part of its diversification strategy. By November 2011, DuraCloud was launched as a subscription solution. In parallel, the DSpace and Fedora projects continued to advance with new feature releases, where each respective project community was able to prioritize and coordinate features and functionality by working closely with the DuraSpace technical team. As Moore funding came to a close in 2011, DuraSpace continued to explore ways to build a sustainable business model and over the last two years has created a revenue portfolio consisting of a mix of solution subscriptions, sponsorships, and grant funding. Last year, the organization invested in the creation of an Incubation Program, providing support to other open source projects within the community. VIVO, an open source web application for sharing and discovering information about researchers, their publications, collaborators, and interests, was the first project to be incubated by DuraSpace. VIVO became a full project under the DuraSpace umbrella in 2014. With over two-thirds of its revenue now coming from membership and hosted solutions, DuraSpace recently focused on increasing transparency in terms of how funds are being allocated within the organization. Beginning in 2013, DuraSpace was reorganized operationally into two areas, Projects and Services. Projects are primarily funded by sponsorship revenue, while Services are primarily funded by subscription revenue and grant funding for development work which can be applied to either operational area. DuraSpace has established project governance models for each open source project it supports, which is a strategy for engaging DuraSpace members in planning the overall strategy and resources for each project. Steering committees have been established for DSpace, Fedora and VIVO that provide strategic oversight and resources to the projects. DuraSpace aims to continue to broaden its value to the community by bringing in new projects and services that promote and enable durable access to digital content.